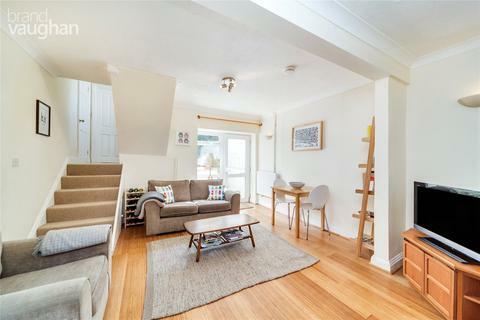 An attractive 2 bedroom first floor converted flat with a communal rear garden and single garage. The flat forms part of this imposing detached Victorian property in this elevated position enjoying a bright west facing aspect with views directly overlooking Preston Park. Situated in the highly favoured Preston Park Conservation area in this wide tree lined avenue with local shopping facilities available in Preston Drove and at Fiveways. The accommodation comprises: impressive communal entrance hall, entrance hall, bright and spacious west facing lounge/dining room, modern kitchen, 2 bedrooms, bathroom with white suite, attractive communal rear garden, and a single garage situated at the rear of the property. 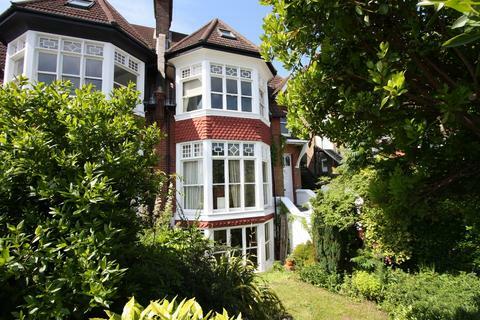 The flat also further benefits from gas fired central heating and is offered for sale with 'No Onward Chain'. The property is situated in this highly favoured residential area forming part of the Preston Park Conservation Area in this wide tree lined avenue, the flat is situated at the front of the building enjoying a lovely bright west facing aspect with views directly overlooking Preston Park with its recreational facilities. Local shopping facilities are available in Beaconsfield Road, and with the popular Fiveways closeby with its range of local independant shops, cafes and bars. The Preston Circus/London Road shopping thoroughfare is also within easy walking distance, and both Brighton and Preston Park mainline stations are within easy reach providing a commuter service to Gatwick and London. Local bus services are available in Stanford Avenue providing easy access to Brighton city centre and seafront. A most impressive communal entrance hall with parquet style flooring, feature fireplace and turned staircase with decorative balustrade leading to the first floor landing. A lovely bright west facing lounge with views directly overlooking Preston Park. Original ceiling covings and picture rail. Radiator. Large window to front. Fitted with a range of units comprising stainless steel single drainer sink unit with mixer tap inset in working surfaces with cupboards and drawers below. Integrated 'Neff dishwasher. Space and plumbing for washing machine. Space for upright fridge/freezer. Further range of working surfaces with fitted 4 ring gas hob with fitted electric oven below and additional cupboards and drawer units. Original period style cupboard housing gas central heating combi boiler. Tiled splashbacks. Matching range of wall cupboards and cabinets incorporating extractor hood. Radiator. Window to front enjoying a lovely bright west facing aspect with views directly overlooking Preston Park. Radiator. Built in linen/storage cupboard. Range of fitted wardrobe cupboards providing hanging and storage space and with corner display shelving. Radiator. Double glazed window to side. Radiator. x2 Double glazed windows to side. Part tiled walls with white suite comprising panelled bath. Wash hand basin. Low level wc. Radiator. Double glazed window to side. Large communal rear garden with area of lawn and well stocked flower and shrub borders. Mature trees and shrubs. Single garage with up and over door in a block of garages situated at the rear of the property and approached via a driveway at the side of the property. Property reference 14563833. The information displayed about this property comprises a property advertisement. OnTheMarket.com makes no warranty as to the accuracy or completeness of the advertisement or any linked or associated information, and OnTheMarket.com has no control over the content. This property advertisement does not constitute property particulars. The information is provided and maintained by David & Co - Brighton. Please contact the selling agent directly to obtain any information which may be available under the terms of The Energy Performance of Buildings (Certificates and Inspections) (England and Wales) Regulations 2007 or the Home Report if in relation to a residential property in Scotland.